NOTE TO PIX: pictures can be taken at the public exhibition on Saturday Dec 2 at the Jewry Wall Museum, Leicester. An ancient curse aimed at a thief is one of a number of treasures to be unveiled to the public for the first time, following the largest archaeological excavation the city of Leicester has ever seen. Over the past three years, a team of up to 60 archaeologists from University of Leicester Archaeological Services has been working on a number of sites in the city. Almost 9% of Leicester’s historic core has been subject to investigation in some form, giving new insights into the appearance and development of the Roman and medieval towns. 'To the god Maglus, I give the wrongdoer who stole the cloak of Servandus. Silvester, Riomandus (etc.) ... that he destroy him before the ninth day, the person who stole the cloak of Servandus…' Then follows a list of the names of 18 or 19 suspects. What happened to them is not recorded. Before the discovery of this object, archaeologists only knew of the names of three or four of the inhabitants of Roman Leicester, so the find is of great significance. 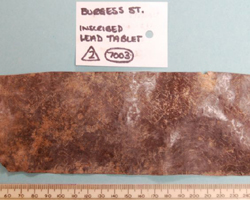 Richard Buckley, co-Director of the University of Leicester Archaeological Services, said: “Curse tablets are known from a number of Roman temple sites in Britain, and are thin rectangular sheets of lead bearing the ‘curse’ inscribed with a point or stylus. They were usually rolled up and were probably nailed to the wall of a temple or shrine. Most curses seem to relate to thefts and typically the chosen god is asked to do harm to the perpetrator. It has been suggested, on the basis of name forms and the value of items stolen, that the curses relate to the lives of ordinary people, rather than the wealthy, and that they were perhaps commissioned by the dedicator from a professional curse writer. “The Leicester curse is unusually well preserved and had not been rolled up. After initial cleaning by a conservator, it was clear that it was covered in handwritten script, including a column of text which looks rather like a list. The inscription is currently being translated by a specialist at the University of Oxford. He notes that the Latin of the script reflects the spoken language in several ways. There are 18 or 19 names, a mixture of commonplace Roman (like Silvester and Germanus), Celtic (like Riomandus and Cunovendus), and 'Roman' names found in Celtic-speaking provinces (like Regalis). The god's name might be a title - 'prince' in Celtic. “The curse is a remarkable discovery, and at a stroke, dramatically increases the number of personal names known from Roman Leicester. So far, we have the soldier, Marcus Ulpius Novantico, from a military discharge certificate of AD106, ‘Verecunda’ and Lucius’ from a graffito on a piece of pottery and ‘Primus’ who inscribed his name on a tile he had made. The name forms will help us to understand the cultural make up of the population, whilst the subject matter tells us about the spread of spoken Latin and the religious practices of ordinary people”. The excavations have also produced many thousands of sherds of pottery, together with building materials, animal bone and a large variety of smaller objects, including Roman weighing scales, coins, brooches, gaming pieces and hairpins. A find of note from the medieval period is a piece of high status chain mail. On Saturday 2nd December, between 11am and 4pm there will be a ‘meet the specialists day’ at the Jewry Wall Museum (by kind permission of Leicester City Council) with posters and displays of finds to showcase some of the main results of the work. Images of the ancient curse tablet will be on show- the tablet itself is in safekeeping with experts in Oxford. The site directors will be on hand to talk about the results of the excavations and there will be the opportunity to view some of the finds and meet specialists in Roman pottery, medieval and post medieval pottery, animal bone, human bone, building materials, small finds and environmental evidence. Richard Buckley commented: ‘The recent excavations have been on a scale rarely seen in British cities, and for the first time in Leicester it has been possible to look at large areas of the Roman and medieval town. This has made it possible to examine complete buildings and to see how an entire neighbourhood changed over almost 2000 years. A private viewing will be held the day before the public exhibition (on Dec 1), and guests for this will include the Deputy Lord Mayor and Deputy Lady Mayoress, representatives from city organisations and societies, the Highcross Quarter project and the Leicester Square project. Pro-Vice-Chancellor of the University of Leicester, Professor Bill Brammar and Head of the School of Archaeology, Professor Colin Haselgrove will be among the University guests in attendance. Please note the curse tablet is currently in safekeeping in Oxford –it is not available for photographing. However, images of the tablet are available from pressoffice@le.ac.uk and images of the tablet will be on exhibition on Saturday. The public event will take place between 11am and 4pm on Saturday 2nd December at the Jewry Wall Museum.